Why pick Belize as a single traveler – and tips on how to do it! 1.) Belize is very popular for adventurous, free spirits – it is not known for its luxurious all-inclusives – and although there is a lot that is romantic about Belize, this is not what it is best known for. Belize is known for being off the beaten path, full of adventure, the 2nd biggest reef in the world, Mayan ruins, cave tubing, and being a rustic paradise where you don’t have to be fancy. Belize gets a LOT of single travelers because the adventures, while pretty sweet to experience with someone else, are not necessary to have with another, the way that an all inclusive on the beach would be. 3.) You are NOT going to stick out in the Belize crowd – on almost any excursion, there are singles, you will see them at hotels and bars, and it does not look weird here at all. In fact, I have never been to a place in my life where people seem to become best friends over the course of a vacation – and I have been to many places where I didn’t talk to another traveler for a week. Belize is small, intimate, warm, and friendly – and the vibe here is one of openness and inclusion. 4.) Materialism is NOT a thing here, and it looks almost funny/definitely out of place if you happen to see really nice cars, shoes, bags, jewelry, etc. In fact, you will stick out if you are wearing more than a tank top and t-shirt – barefeet are even ok. In general, when traveling alone, you can feel free to be as casual as you want. 5.) Many/most hotels are small/boutique in nature, and the excursion groups can be as small as 3-5. It is so easy to make fast friends here – you aren’t a small fish in a large pond here, quite the opposite. People WILL talk to you if you are sitting alone and look reasonably friendly! 7.) Getting around the entire country by yourself can be easy, painless, and not scary at all – you can hop on the regional puddle jumpers safely and easily and get around the country in no time – minus your fear of flying in something the size of a car, most any traveler will feel comfortable and safe. There are many options of course, like driving, shuttles, or the bus, but even for a beginner traveler you can travel the country with ease in the puddle jumpers. 9.) Do a bit of research before you come to see where to go each night, near your hotel, so nighttime alone travel is minimized. You will probably get invited to group outings before the end of your trip, but at least the first few nights – some great resources are the Placencia Breeze online, the Placencia What’s Happening page, or take a walk around town and read the boards out front at the bars. There are activities aimed at socializing every night in the tourist towns. A great link in San Pedro is THIS for nightly happenings. 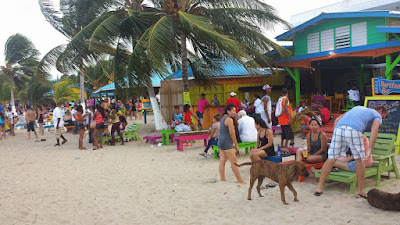 San Ignacio is a town that is less beach bar/tourism driven so I would travel there for the excursions and adventure, but less for nighttime fun. 10. )Here are some recommended hotels and activities in Placencia and San Pedro for some single traveler fun! Activities – hang out at the pier beach and The Shak, swim around Barefoot, Cozy Corner or Sailfish during the day, set up a snorkel the first day you are there – you can easily find these by the chalkboards all through town. This is a sure way to meet people! 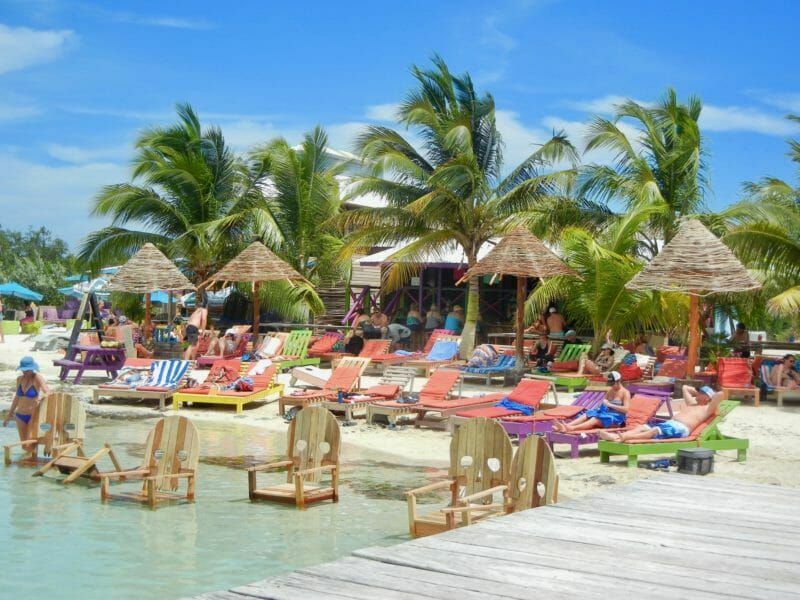 Also go to Caye Caulker and hang out at the Split for an afternoon. 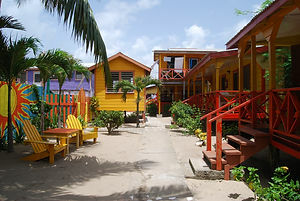 Hotels – Julia’s Cabanas, Miramar, Sea Spray, Cozy Corner, Anda Di Hows, Lydia’s Guest House are all casual, laid back social hotels. Hotels – Sandbar for sure, this is modest but is truly your best chance of meeting others, Pedro’s Inn for younger backbackers, Sun Breeze Inn, slightly more upscale but great social pool and bar attached -these are all right in the heart of town with social stuff going on all day long. Laura and her husband David purchased a half acre on the Caribbean Sea in 2014, in Placencia, Belize. They have built their own version of paradise, and they now operate the only boutique, adults-only microresort, walking distance to everything in the village. Caribbean Beach Cabanas was rated the 2017 Small Hotel of the Year by the Belize Tourism Board, and was featured on HGTV's Beachfront Bargain Hunt. You can visit their site at www.caribbeanbeachcabanas.com. In April of 2018, they opened their second boutique hotel, www.purboutiquecabanas.com, in Ambergris Caye!